During an Alumni Physicians of Feinberg dinner in October, Benjamin Singer, ’07 MD, ’11 GME, assistant professor of Medicine in the Division of Pulmonary and Critical Care, described how he found balance as a medical student in part by remaining an active musician. 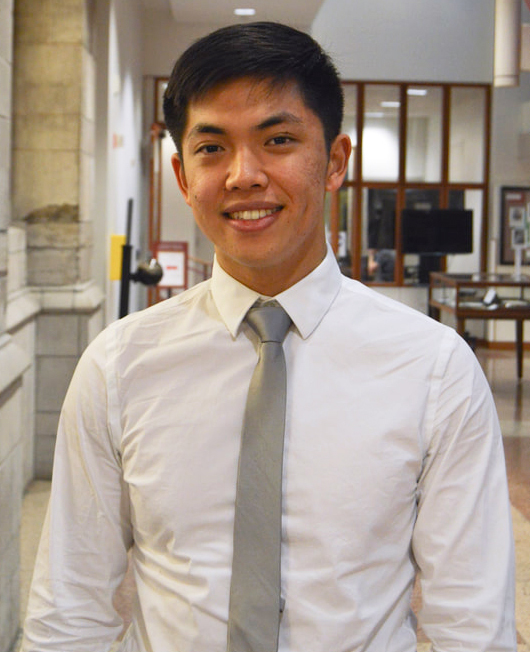 For Michael Wang, a first-year medical student in attendance, the conversation resonated. “There’s often a time crunch for medical students and professionals in this field, but making time for music — something that’s relaxing and through which a lot of us find meaning — can be a very positive influence on our lives,” Wang said. Wang and Bettina Cheung, also a first-year medical student, had helped lead a student-run orchestra while undergraduates at Yale University. Having noticed that Northwestern’s Chicago campus didn’t yet have a similar program, the two students committed to creating one. But it wasn’t until Singer connected them with a faculty adviser — his own Feinberg college mentor — that their plans took off. The Northwestern Medical Orchestra (NMO) began its inaugural season this February. The organization is composed of a diverse group of students, faculty, alumni and staff throughout the Northwestern Medicine community, joined together by a shared love of music. 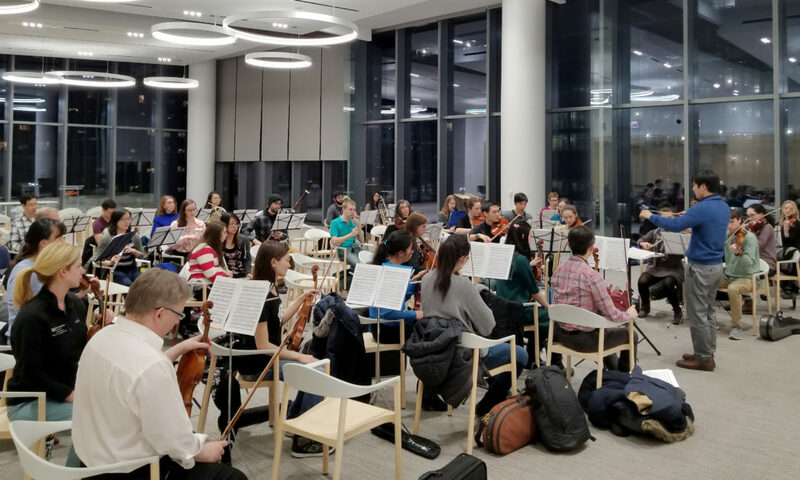 The orchestra, which rehearses every Tuesday evening in the Shirley Ryan AbilityLab, plans to perform a number of concerts in the spring for patients and community members. The season repertoire will include a variety of classical and pop numbers, from Dvorak’s New World Symphony to a John Williams score. 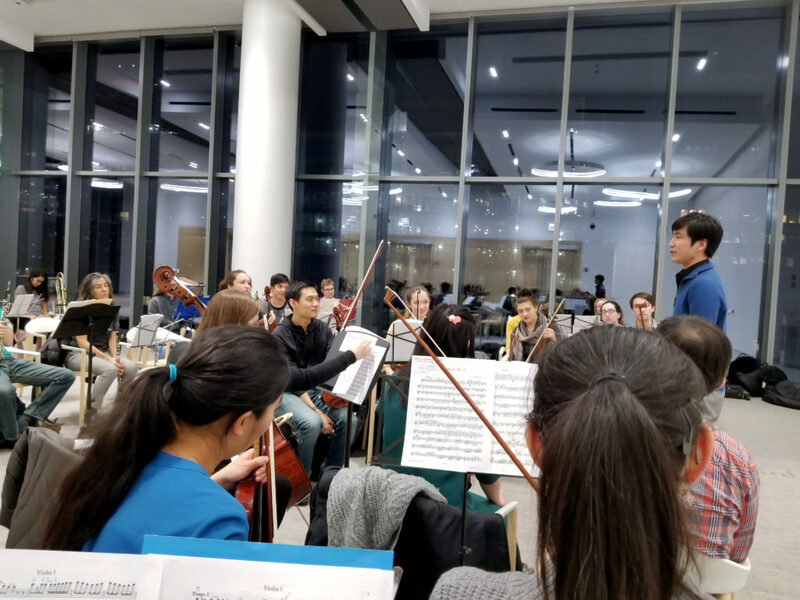 The orchestra is the result of the passion and planning of not only co-founders Cheung and Wang, but also a number of dedicated students, faculty and staff. The group’s faculty advisor is Gregory Brisson, MD, ’94 GME, clinical assistant professor of Medicine in the Division of General Internal Medicine and Geriatrics; Tommi Raij, MD, PhD, research associate professor of Physical Medicine and Rehabilitation — and a classically trained violinist — is the group’s AbilityLab liaison; and Dan Schwarzlose, a trumpet player and staff member in Development and Alumni Relations, is the alumni liaison. Michael Wang, a first-year medical student, is the music director and one of the co-founders of the Northwestern Medical Orchestra. “I think what has been really impressive about this effort so far is how much the Northwestern Medicine community is already knit-together — as you can see from our board, and the people we’ve met along the way,” Wang said. The orchestra currently includes medical students, doctoral students, residents, research faculty, staff, clinicians at various Northwestern Medicine hospitals, as well as alumni throughout the city and suburbs. “Playing music together helps to break down the hierarchy of training and remind us we are all colleagues with a common goal,” Brisson said. Taichi Fukumura, a doctoral student at the Bienen School of Music on the Evanston campus, is the orchestra’s artistic director. The NMO student board also includes first-year medical students Roya Zandi, Annie Huang and Matt Heffernan. The orchestra, open to all, is specifically seeking musicians who play bassoon, tuba, cello, viola and string bass. Rehearsals take place Tuesdays from 7 to 9 p.m. in the 10th floor conference rooms of the Shirley Ryan AbilityLab. To learn more, please contact nmorchestra@u.northwestern.edu.